The Distress Ink Pad Holder (formerly known as the Petite Ink Pad Holder) is ideal for Distress®, Marvy®, and papertrey™ ink pads. 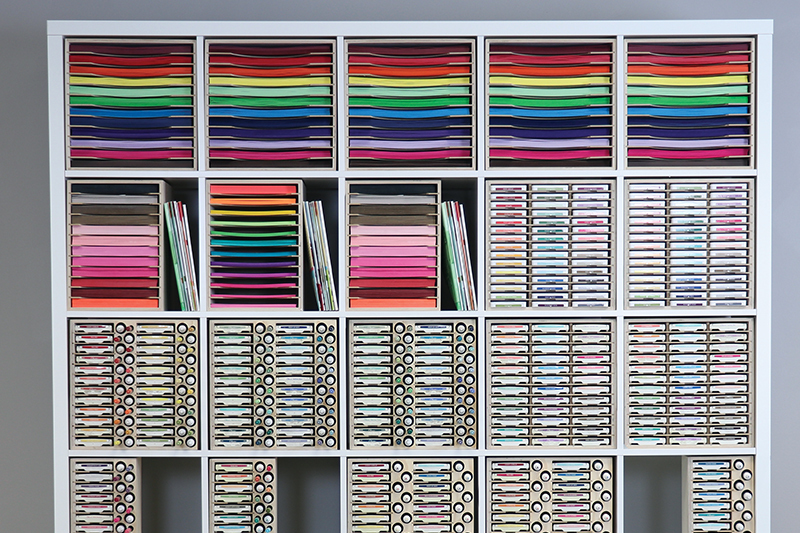 Your colors are displayed in columns of 12 so you can keep each color family organized together. The finger slot cut in each divider makes removing the ink pads easy and the dividers can be taken out for storing larger accessories. (The sturdy c enter divider is not removable.) This product has the option of being wall-mounted too! Love it! Will plan to purchase another to house my Oxides! Thank you Stampnstorage! This is the first product that I have ordered from stamp and storage. Really like this a lot. They were having production delays so it took longer to receive. They were kind enough to send me two holders where you could display some of your cards for free. It is so wonderful to finally be able to have all my distress pads in one place. 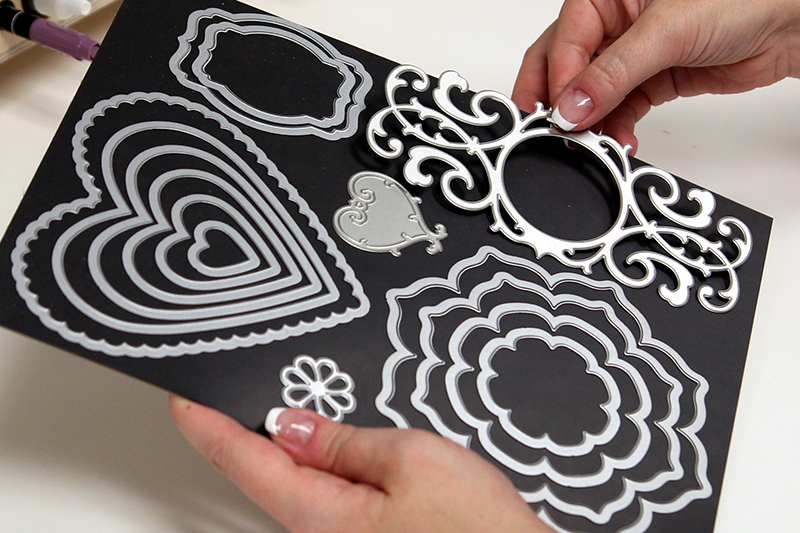 This is a must have in your craft room. I had a few empty spaces so I put spools of ribbon in there for now. Very well built, absolutely love it!! Just got this! It’s really well-made and I absolutely love it. I’m going to start labeling my ink pads and swatching them out, I’m so excited! I purchased the Distress Ink pad holder (60) to store my Distress Oxides - My Hubby built me an ink Storage shelf a long time ago but it doesn't seem to fit my distress oxides, as well as I, would like, so I got this one and OMGOSH... it's fabulous and my inks sit perfectly! I especially like the "dips" were each pad sits. 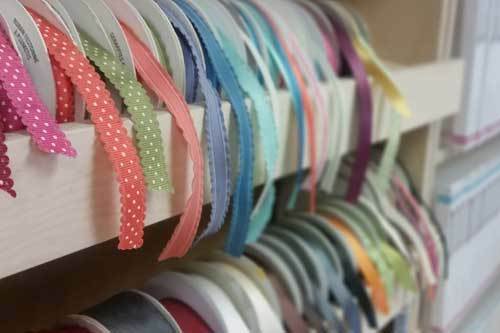 They are easy to pull out and looks good in my craft space! I'm also impressed with all the storage options Stamp N Storage has to offer... I'll be back for some other storage items I've already added to my wish list! Perfect for my distress pads. Your company is the best! Custom storage, quality workmanship. The petite ink pad holder works really well and holds the larger size distress inks. The only thing I wish was available for purchase was some "fillers" so I can also put in the tiny distress ink pads in there as well. While I can do that now, it's too easy for them to fall to the back where you can't see them or get them out. Maybe a thin 'shelf' with tiny dots so that the inks stay in position and you can pull it out and make full use of the entire depth of the holder. I am so glad I found this company at Stampaway. Their products are solid, well-built, and fit my Ikea shelves perfectly. I look so organized now. I use my inks more now that I can see them all. The people at Stamp-n-storage are friendly, knowledgable, and just plain awesome. Definitely recommend. 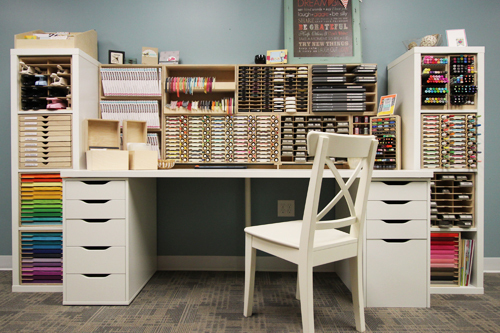 This is a great addition to my stamping area., keeps me organized. This fit perfect in my stamp area. Wish I had more space for a whole stamp area from you. Great product, arrived ready to load. Now I can see all my inks in my Ikea unit. Keep up the good work with all the great products. This is my second 60 slot Distress Ink holder. Had to have it when the new Distress Oxides arrived. Now I have my original 48 slot one to fill with other small ink pads. This is a great company, making quality products for crafty people! I'm so so happy to have this one single Distress Holder that exactly holds all of the Oxides, including the 12 that were just released. Everything fits perfect and it's a tiny little thing. I love it. I have purchased several Ink Pad Holders and highly recommend them for you to consider. It is important to order the right one for the type of Ink pads you want to store. You will be very happy with your product. I love these storage units. They are very well constructed and I love mine. Reasonably priced and I received them in a very quick turn around.Thanks so much for making a great product!! I was hesitant to purchase considering the price, but was very happy with product. Very well made using high quality materials. I have the capability to make my own but I don't have access to these type of materials. Great product, well made and in the USA besides. I now have enough for all the Distress Oxide pads. I love these holders. And like that the shelves are now removable, as an option. All their products are extremely well made in the USA. I'm gradually converting a lot of my storage products to this company's lines. What a wonderful product, Fits perfectly where i need it and holds the Distress ink pads perfectly. I LOVE IT! 60 Distress Ink pads are NOW Perfectly Stored,---easy to get to, and my SnS craft room organization just gets better with every offer! I now have 3 of the stamp pad holders that fit in my Ikea shelves. They are so beautifully made and fit perfectly. It's so nice to have all of my stamp pads where I can easily access them. Was shipped quickly. Customer service is great! Love my ink pad holder. Very well made. This petite ink pad holder meets all my needs. I put all my distress oxide ink pads in it. Perfect size of slots and easy to grab the ink pads. Love that all of my Distress Inks fit into this holder and are so easy to access when I'm in a creative mood. Awesome product! I love being able to store all my distress inks in a manner of easy access. I am ordering a second unit so I can get them all out of baskets and still have some room for the new Oxide inks. Place my order on a Sunday and my package was delivered to my door the following Friday and I live on the west coast! Item was in perfect shape. Thank you for providing excellent service on a wonderful product. My first Stamp n Storage product purchase and I love it! In fact, I am ordering a 2nd one so I can store all my Distress Inks owned and future purchases of the new Oxide inks as they become available. Order was filled promptly and item was received in perfect condition. Highly recommend Stamp n Storage for organizational items. This if perfect for all my Ranger Ink Pads. I can see and grab exactly what I want without fumbling thru a drawer. This is perfect for my Distress Oxide stamps. Love it. So I love this unit, my distressed inks fit wonderfully. My husband does woodworking and he was very impressed with the quality. Just wished I had gotten the 36 slots now since I have other pads that fit nicely. Like many others, I needed a place for my distress oxide ink pads, as I had already purchased several products for storing my ink pads, and other items. This storage unit is perfect for that purpose. My only disappointment was that it is not the same depth (from front to back) as all the other organizers I have purchased from this site. So when I add this to my line up, it isn't even with the rest. Likely I did not notice that when I ordered it, and likely would have ordered it anyway, as I love these products. Like I said, it just surprised me. I have several of their organizational pieces, and have no complaints. The company is wonderful to work with, they are quick, and responsive. I recommend them and their products without hesitation. I'm so glad I have a place for my new Oxide ink pads. This is perfect. The finish on these units is outstanding! WOW! I love this storage system. I am glad I bought the unit that stores 60 pads. Especially since they have recently introduced the new Oxide Inks! I can see I will need another soon! Thanks for all your wonderful storage products. They keep all my stamping supplies VERY organized. 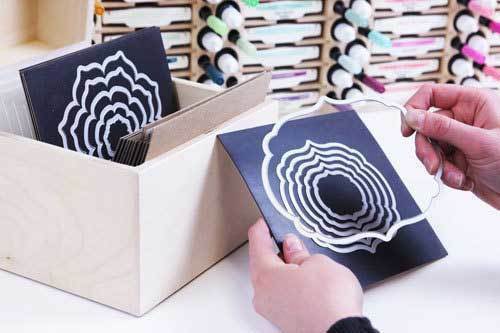 I love this ink pad holder and have 2! The pads fit beautifully with enough space for the blending foam on the bottom - no separate storage needed! Fast shipping and beautifully finished! Thanks! I have ink pad holders from three different companies and this one is by far the best. It is less bulky, lighter, and fits my Distress Inks better than any of my other holders. 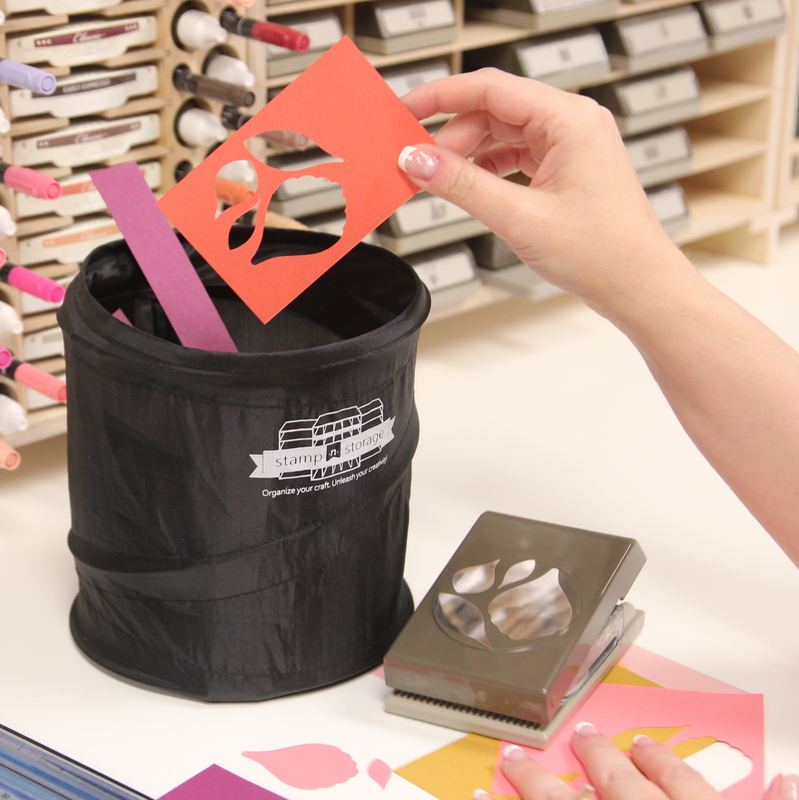 I'm going to be replacing all of my craft storage with Stamp-N-Storage products. I ordered this product for my distress inks and it works perfect. Now with all my inks labeled it looks beautiful on my counter and ready to use. The unit I purchased for distress ink was the perfect fit. This is my 3rd storage purchase from Stamp-N-Storage and as always I am extremely happy with my purchase. I just got my 60 Ink Pad Holder and I'm about to spray paint it to match my craft studio. It is so well constructed and very solid. Happy to have it as part of my storage supplies. I bought this specifically for my Distress Ink Pad collection. It didn't disappoint! Like every other Stamp-n-Storage product I've purchased, it's solid, well made, and designed perfectly for the intended use. When Ranger added 12 new colors I was lost. This is perfect to hold those new colors and keep my space tidy. I am really impressed by the petite ink pad holder. It is well built and compact enough not to be a nuisance on my worktable. I will say that one of the shelves was cracked, probably due to shipping, but when I contacted Stamp-n-Storage about it they were more than happy to replace it and did so quickly. I will be ordering more from Stamp-n-Storage in the future based on both the quality of the product and the quality of the service! This is such a wonderful organizer for all my Tim Holtz ink pads. Now I want all your products, so will just have to hint at birthdays and holidays! Thanks for such a great product! I can actually find my distress inks in no time now that I have them organized and can see the name of the colors. The quality of this product is phenomenal; however, some of the spaces were quite tight for my Papertrey Ink ink pads, while other slots were spacious. Love my Petite Ink Holder!!! it is so cool to finally see all of my tim holtz distress inks!! So very happy with the purchase of the 60 petite in pad holder. Now all my Tim Holtz ink pads are organized together and so easy to locate the color I am looking for. Great product and recently ordered the 72 slim ink pad holder & 24 standard ink pad holder to get all my stamp pads organized together in one system. I love how the pieces can be stacked together and looks so fantastic. Thanks for great products!!! Got this for all my distress inks and I love it. Just like all of StampNStorage's other products, this is sturdy and well made. The only constructive criticism that I have is that I'd love it in a larger size! I filled it up immediately! LOL Thanks for your great products, I'm a huge fan! I purchased the 48 Petite Ink Pad Holder. I stained and clear coated it to match the other items I've purchased from here. 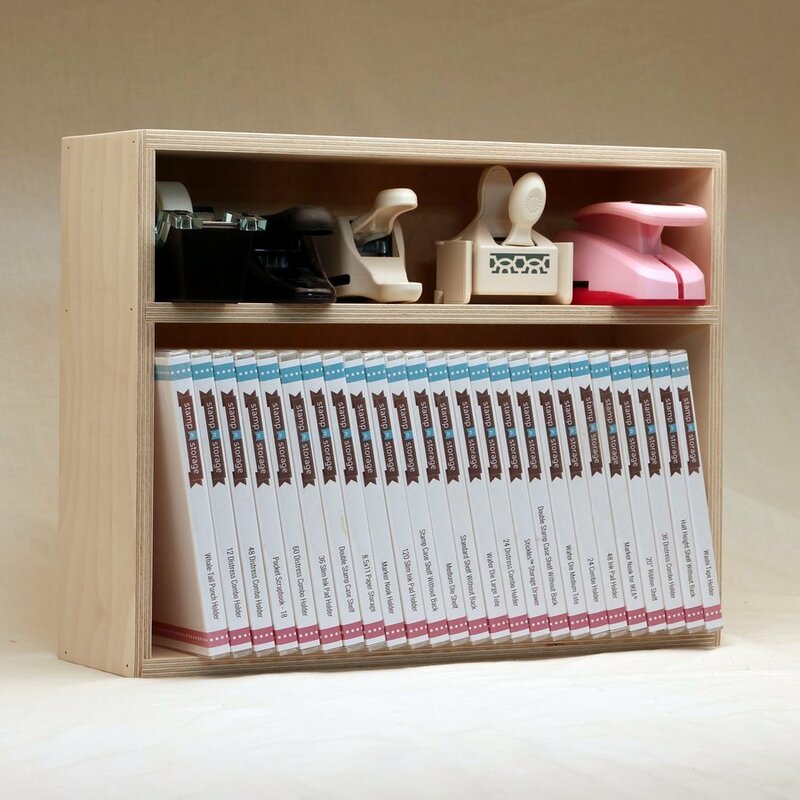 It's a nice piece of furniture that is well made and definitely helps with the organization. I like how organized my ink pads are. 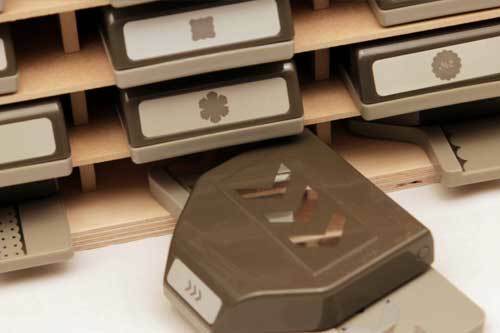 In the past I had most of my stamp pads in a container which made it so inconvenient to use. I therefore never made much use of those inks. Now I have all of my ink pads labeled and very convenient to use. I love this petite ink pad holder! I have the 24 ink pad holder and it fits the Tim Holtz distress ink pads perfectly! 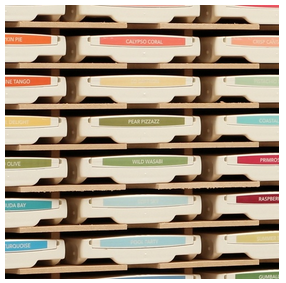 Not only is it so practical, like every other Stampnstorage product, but it's also as cute a bug...:) What can I say - Brett and his wife are geniuses for coming up with the most attractive and practical stamping storage units! Each time I think they can't possibly think up anything else, they come up with another new and innovative product...! Another great product! All my distress inks fit perfectly. Well built and sturdy! Great customer service! Loved the ink pad holder. Would reccommend perfect for my Tim Holtz pads. Great service. 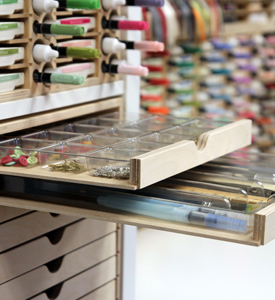 Love, love, love this ink pad storage for my Distress Inks. I have all the ink colors and they look great with the colored labels from the Ranger site. I ordered the 60 pad holder and have room to add the Color of the Month. Great quality and sturdy. It's so much easier to use having everything in my line of sight! I had dreamed of owning 'proper' ink pad storage for years, but felt the expense was more than I could justify, so have always used makeshift alternatives... These have worked pretty well for many of my pads, but not so much for the Distress pads. Two years ago I actually followed a DIY video to create a storage unit out of foamcore board... best alternative to date, but still not perfect... Then Ranger announced "12 new colors for 2015" -- What to do??? Ignore the new pads (too painful to think about)... Swap out my standard pads for the minis (a costly re-investment)... Create a new unit (too much work for a less than happy fix)... or take a chance and invest in something to last. Enter a Google search which led me to Stamp-n-Storage and this Petite Ink pad Holder. There were other sites offering similar constuctions, but not with a combination of 60 cubbies, finger slots, a natural-state wood finish, and shipping already factored into the price. I also really liked how expicit the S-n-S website is with prodeuct information -- descriptions, diagrams of dimensions, pad compatability listings, etc. All things considered and prayed over for weeks, I finally decided to take the plunge... So, so, so happy!!!! My unit arrived super quickly and well packaged. Definitely well-crafted and very sturdy! Perfectly sized for the Distress pads (including the round sponge applicators velcroed to the bottom of the pads). Note: Due to space and location limitations (a corner of the kitchen) my storage unit is housed in cabinet drawer with the ink pads on their sides. Still absolute perfection! Bottom line - This was a great purchase, and I couldn't be more satisfied or happy. This is my first product purchased from Stamp N' Storage. The holder is made of good quality materials and seems very sturdy. I'm using it to store my Papertrey Ink pads. The pads are an odd shape and size. This holder was recommended on the Stamp N' Store website for distress inks and Papertrey pads. The depth is ok, but the height of each slot is inconsistent. Some slip in just fine, and others fit much too snug. I have been drooling over this ink pad holder for some time, and I couldn't be happier with it. It holds my distress ink pads perfectly, and they are easy to get out and put back in. I'm already saving for a second one to hold my other small ink pads. Love this company! This is an awesome product. I used to have to pick up a stack of pads and sort through them to get the one I needed. Now they each have their own shelf and I can select just the one I need. I had been coveting this ink storage shelf for quite some time; finally bit the bullet and bought it. When the shelf arrived, it was defective -- boy, was I disappointed. When I contacted the Stamp N Storage, however, I was given awesome customer service. They apologized and they quickly sent me a replacement shelf without even having to send the original back. When the second shelf arrived, it was perfect! I have all of the colors Distress pads of ink and have attached a blending pad to the bottom of each ink pad with velcro. They still fit into the slots wonderfully. I leave the shelf on my crafting table constantly for easy access. I also bring it along to crops and it travels well as it is very sturdy. Thanks for a great product! I purchased this piece several months ago for my distress ink pads and was so happy when it arrived. The service was wonderful, shipping was very quick. I love seeing all of my ink pads right in front of me and will definitely purchasing more units from Stamp N Storage. 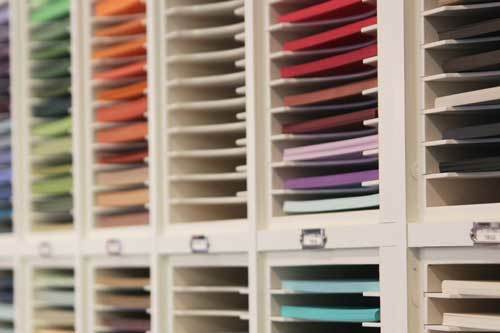 Best storage for Distress inks! This is the first product I bought from Stamp 'n Storage, and I must say it was long overdue! Now my Distress pads are out of a drawer and are more convenient and accessible sitting on my desktop an arm's length away. I did seal and stain the wood with a product designed to do this. I love it. This company knows how to make storage for ink pads! The circular thumb access is so great. Just hook your finger into the bottom of an ink pad and slide it out with ease. I have had my distress ink storage for several months and am thrilled with. It is a perfect. If Ranger keeps coming out with more ink colors I'm going to have to purchase another. If you like to have your distress inks close at hand and organized then this is definitely a wonderful choice for storage. Until I discovered this my Distress Ink storage consisted of a shoe box. It was a nightmare finding the ink color I wanted, and the pads slipped and slid all over! I didn't think twice about purchasing this. I couldn't be happier! I printed out the names of my inks on small labels, inked them with the corresponding color, and applied the label to the side of the ink pad. 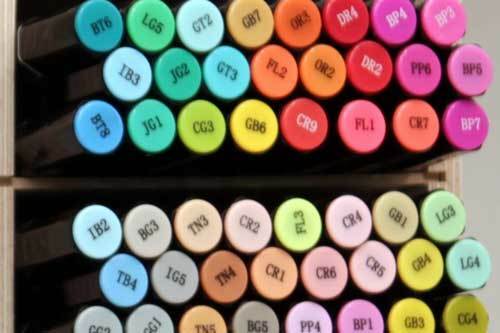 Now I see all the colors and easily remove the one I want. LOVE THIS!! This holds all my Tim Holtz distressed ink pads perfectly. Happy Camper once again.